This e-book is a practical guide offering International Business Etiquette tips that executives should be aware of when they negotiate on international markets. The book opens with a brief analysis of who has to adapt to the customs of the other party. It then addresses the most important aspects of etiquette, following the sequence of a negotiation between companies from different countries: greetings and introductions, use of names and titles, organizing meetings, communication guidelines, business meals, gift-giving, etc. 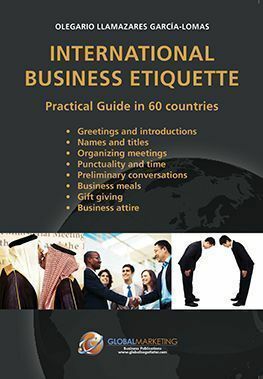 The book includes guidelines for adapting to business etiquette in sixty countries all over the world. The final section is an international business etiquette quiz, which readers can use to reinforce and apply the knowledge they have learned from the book as a whole. Argentina, Australia, Belgium, Brazil, Bulgaria, Canada, Chile, China, Colombia, Costa Rica, Cuba, Czech Republic, Denmark, Dominican Republic, Ecuador, Egypt, Finland, France, Germany, Greece, Hungary, India, Indonesia, Iran, Ireland, Israel, Italy, Japan, Kenya, Lithuania, Malaysia, Mexico, Morocco, Netherlands, Nigeria, Norway, Panama, Peru, Philippines, Poland, Portugal, Romania, Russia, Saudi Arabia, Senegal, Singapore, South Africa, South Korea, Spain, Sweden, Switzerland, Taiwan, Thailand, Turkey, United Arab Emirates, United Kingdom, United States, Uruguay, Venezuela y Vietnam. OLEGARIO LLAMAZARES GARCÍA-LOMAS is an economist, international trade adviser and managing director of Global Marketing Strategies. He has nearly thirty years experience in the fields of foreign trade, marketing and international negotiations. He is the author, among other publications, of How to Negotiate Successfully in 50 Countries. He is also a professor at IE Business School and has been a featured speaker in numerous seminars and events for international managers.